Private members’ club and independent bottler of whiskies and spirits. 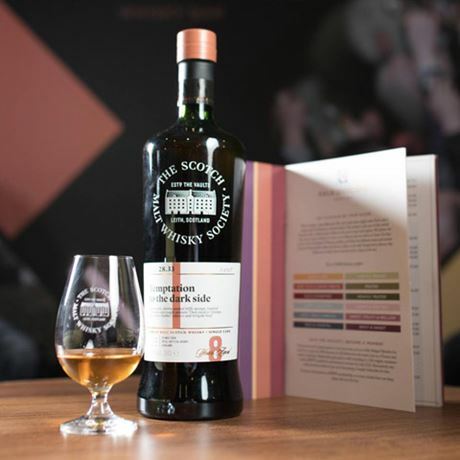 The Scotch Malt Whisky Society (SMWS) is a private members’ club and one of the oldest of Scotland’s ‘modern’ independent bottlers and an influential whisky institution that has played a significant role in the promotion and expansion of enthusiasm for single malt whiskies, both in the UK and abroad. It was one of the key companies to promote the bottling of whiskies at cask strength and the idea of ‘single casks’. Its whiskies are notable for their uniform presentation and the coding system by which the different bottlings are denoted. The SMWS has also bottled Cognac, Armagnac, rum, Bourbon, other American whiskies and even Somerset cider brandy. Annual membership includes access to the society’s numerous venues around the world, as well as to its bottlings which are exclusively for members only. The SMWS was founded in 1983 by a group of friends including tax accountant Philip ‘Pip’ Hills, actor Russel Hunter, contractor David Alison, writer W Gordon Smith and architect Ben Tindall. Hills was already an avid whisky enthusiast and travelled around Scotland visiting distilleries. The group of friends purchased a cask of Glenfarlcas, from which they would occasionally draw bottles and share. In 1983 part of the Vaults buildings in Leith became available as previous occupants J G Thomson had been re-located to Glasgow by owner Tennent Caledonian Breweries. A membership society was established and the cask of Glenfarclas owned by Hills and his cohorts – a 1975 Sherry cask – was released as the first SMWS bottling – labelled 1.1 – in August 1983. Further bottlings were released monthly thereafter until the Society started to grow in size. In 1995 Hills resigned as a director and it continued as a private company without him. The following year the SMWS offered its members a private share scheme, and the money raised was re-invested into the acquisition of a second members’ club at Greville Street in London. In 2004 the SMWS opened its third venue at 28 Queen Street in Edinburgh, and was sold later the same year to Glenmorangie. In 2008, to mark its 25th anniversary, the SMWS updated its livery quite dramatically for the first time in its history with a change to the bottle shape and slight alterations to the label to include a more extensive tasting note. The bottlers were updated again in 2017 to better highlight the whisky styles. The SMWS was sold to a private consortium of investors in 2015.